Looking towards Weston and Lawrence. In the future, Weston Village could be a showcase of how to do retail but currently it’s a showcase of how not to do it. In the GTA, Bloor West Village, Roncesvalles and Streetsville come to mind as old established neighbourhoods whose stores have successfully made the transition into the post-big box and shopping mall era. ‘What’s holding Weston back?’, you may ask. Well, there are many things – one is the stubborn refusal of the citizens of Weston to shop locally and another is the filth and litter that seems to pervade the place (perhaps the two are linked). Near the bus stop on Weston at Lawrence. Part of the problem is that the intersection of Weston Road and Lawrence Avenue West is a transit hub. Many people are coming and going and as a result lots of litter is generated. Let’s not dwell too much on the people who do the littering. It’s a fact of life in a big city. What is obvious though is a tolerance for litter that exists on the part of shopkeepers and also the people responsible for removing it. What’s also obvious is that the same litter stays in place for days if not weeks on end. This attracts yet more litter. Recent rain may have washed the guano from the seats but Weston’s own experiment in leaf and litter composting proceeds apace. While it is Winter and litter is sometimes difficult to remove at this time of year with salt and snow everywhere, thats an excuse you won’t hear in the places mentioned above. It’s certainly no excuse in the current snow-free spell. Five minutes with a good broom could take care of this. 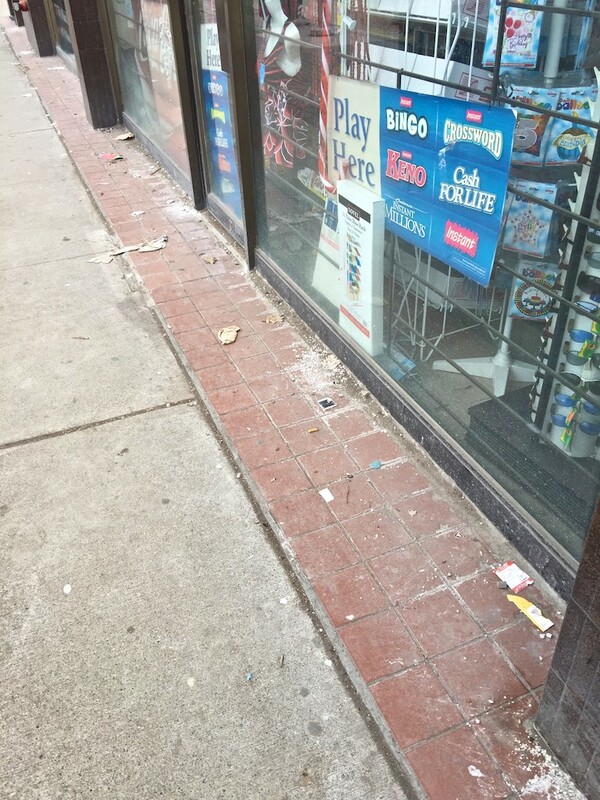 If retail establishments find that the City isn’t taking care of the litter problems, they should complain. Property taxes go towards street cleaning and transit hubs need more of it. It also might be an idea for businesses to spend five minutes daily to clean up around their properties. It might be another idea for our councillor and the Weston Village Business Improvement Area to tackle this problem. This is something that can be implemented quickly with beneficial results. 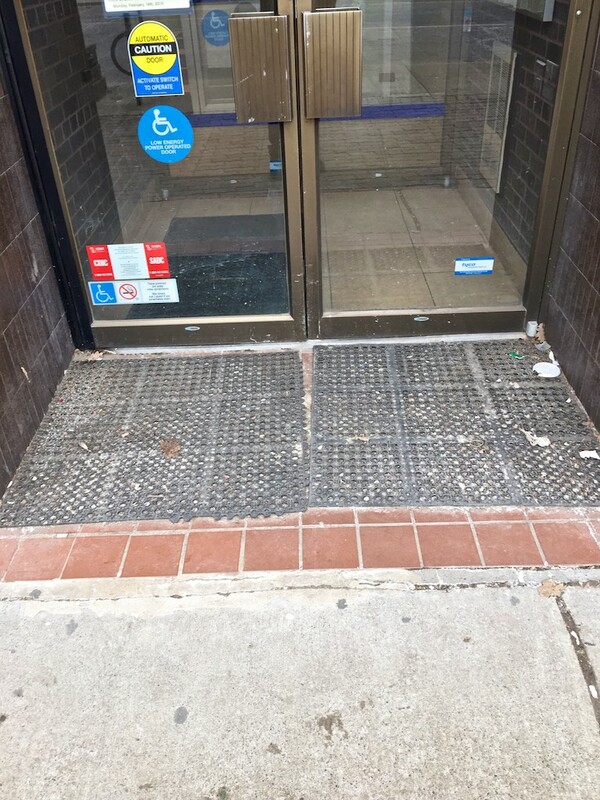 Even the Royal Bank’s entranceway is dirty. As citizens, we too can play a part. 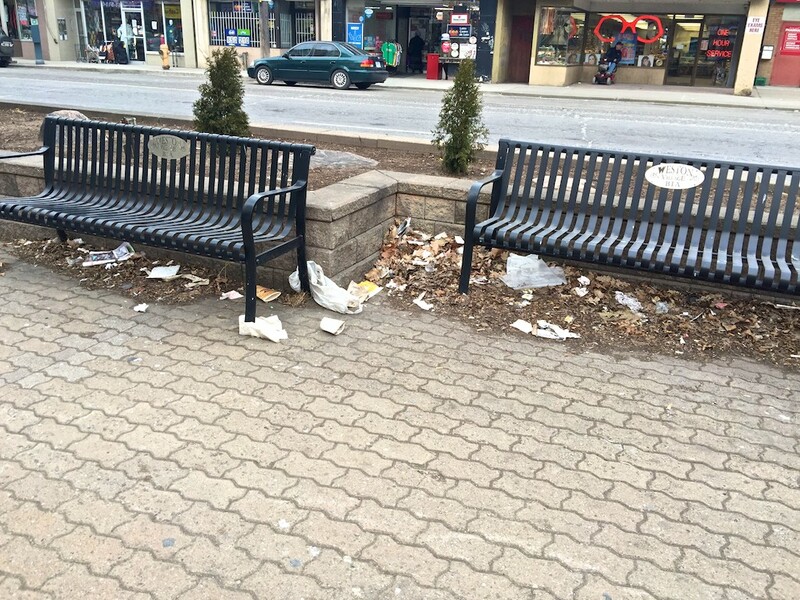 311 is the Toronto City Council number to call about litter (and many other) issues. Calls from several people about the same problem may mean quicker action. 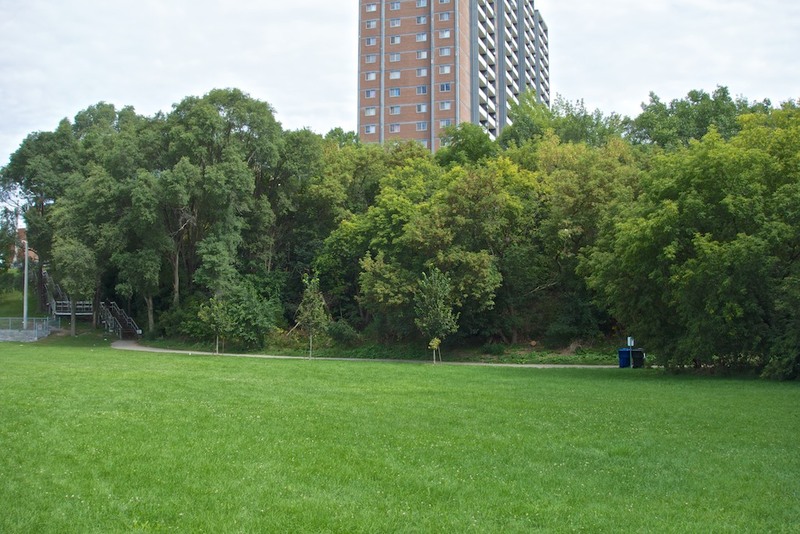 To discuss the matter more directly call Councillor Nunziata at 416-392-4091 or Weston Village B.I.A. at 416-249-0691. Post Script. Not having seen any action on the clean-up, I phoned 311 on Thursday 22nd January to report the mess and was assured that there was nothing to do as the area had been cleaned up. On walking through the intersection today, it was clear that nothing had been done. Thursday January 23: problem reported to 311 and this time I have a reference number. Apparently it takes about 3 business days. Litter is the bane of parks. It degrades the experience of visitors, creates a terrible impression and invites vandalism. 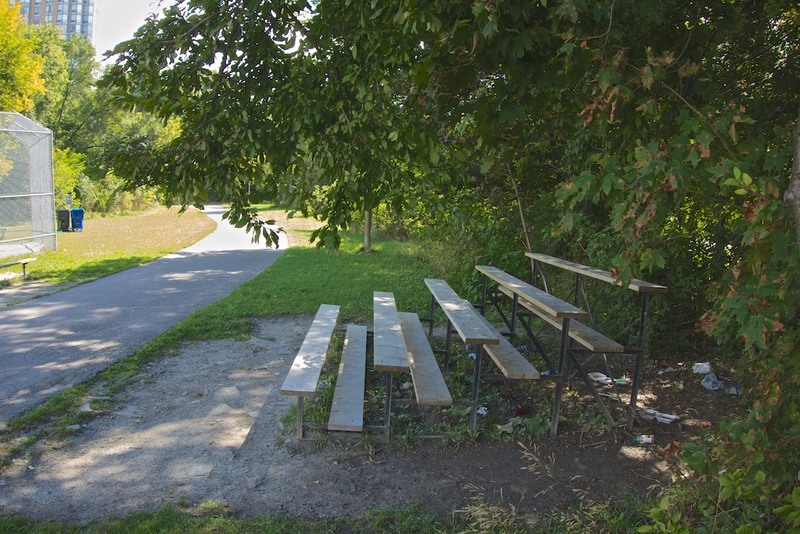 Lions Park continues to suffer from neglect by Toronto Parks Forestry and Recreation when it comes to communications and an intelligent approach in keeping litter to a minimum. As mentioned last month, litter bins are being commandeered by soccer players and used as goalposts for smaller games both on and off the field. It was not possible to leave a message for Park Supervisor Diane Czapla as her phone mailbox was constantly full. With Ms. Czapla unavailable, WestonWeb placed a call to 311 and action was promised. Stakes were hammered into the ground and bins wired to them. Unfortunately, there is nothing to stop anyone disconnecting the wires and removing the bins. If anything, since WestonWeb last reported on this problem the situation has become worse thanks to continued bin removals by soccer players and the not so strategic locations chosen for the bins. Why not move the bins (currently well behind the baseball diamond) to where the garbage is created? Bleachers generate large amounts of garbage. These back onto the delicate ecosystem of the Humber. Why not move the bins near the bleachers so that people will be more inclined to use them? Another example of poor bin placement is by the stairs to Hickory Tree Road. Trash builds up quickly by the stairs; bins are too far away. These bins (on the right of the picture) are too far away and not visible from the stairs. Why not place bins so that they are visible to people descending the stairs. Especially in a high traffic and notoriously littered spot such as this one. Some people of course will toss litter regardless of bin placement. Most will make the effort if bins are intelligently located. 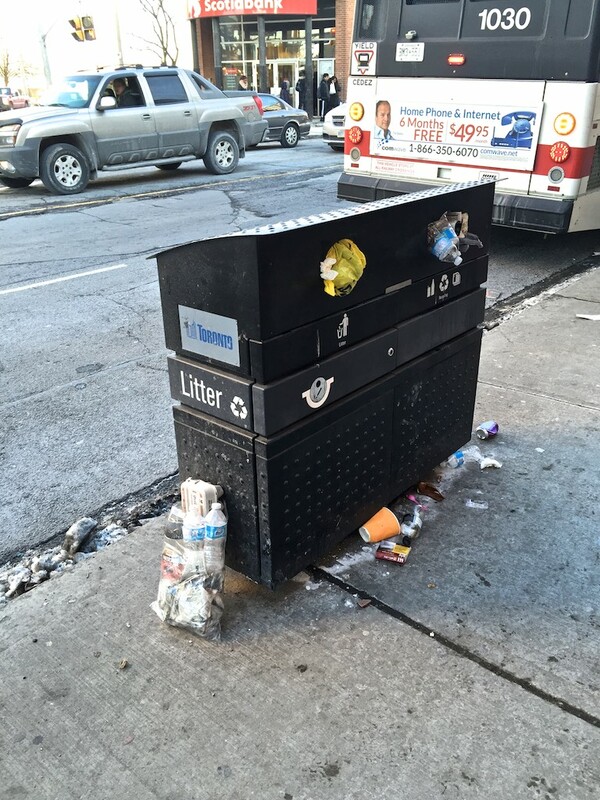 The placement of these bins seems designed to maximize litter. As for the other bins in Lions Park, many are out of reach and behind the fence in the soccer field. An unsatisfactory situation especially when it has been ongoing for months. You can bet it wouldn’t be tolerated in Lambton Woods but somehow it’s ok in Weston. 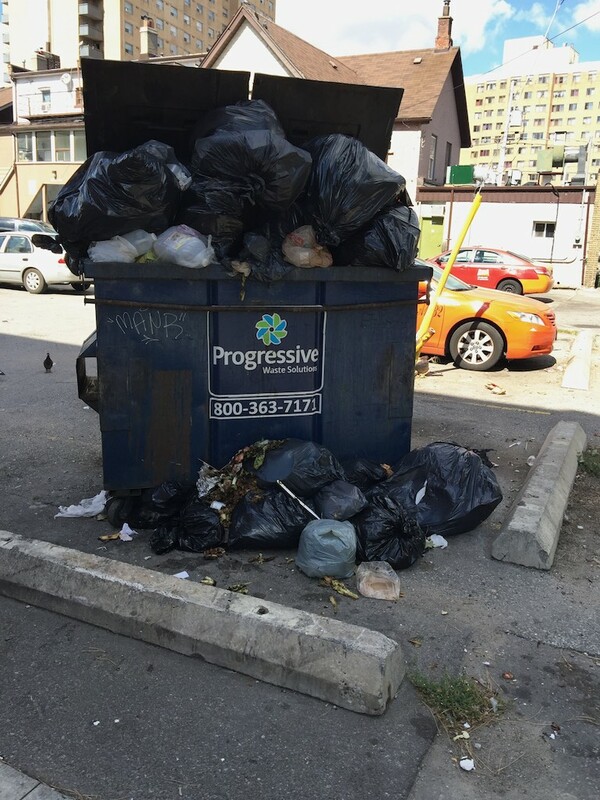 Ms. Czapla responded to WestonWeb’s concerns today (10th September) to say that Toronto’s Solid Waste Management Department was given the job of deciding bin placement a couple of years ago. 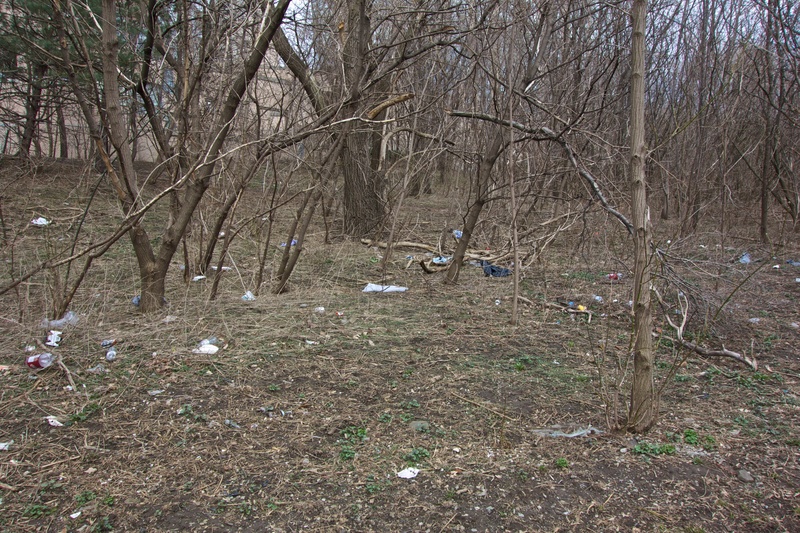 In the meantime, Ms. Czapla will send a crew to remove the build-up of litter in the previously mentioned spots. She also mentioned that it’s up to citizens to help out by placing litter in the proper place. In fact soccer players seem particularly incapable of walking a few steps to a bin – in spite of the increased number of bins on the field. Carson Wiseman of Solid Waste will meet with WestonWeb on Thursday September 12th to help resolve the situation. We’ll meet by the tennis courts at 12:30 if other readers would like to tag along and offer their suggestions. Welcome and not so welcome signs of spring. Spring is late this year and plants and animals alike seem to have been slow to react. 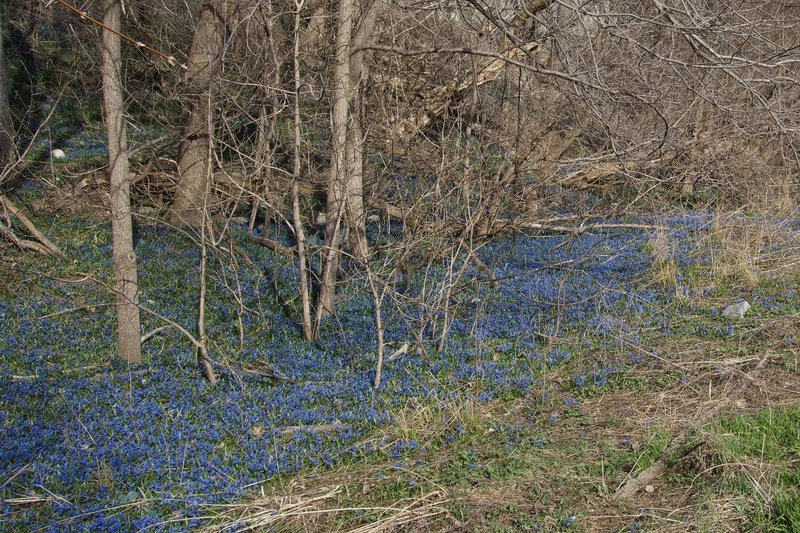 Here are some signs of spring seen around Weston. 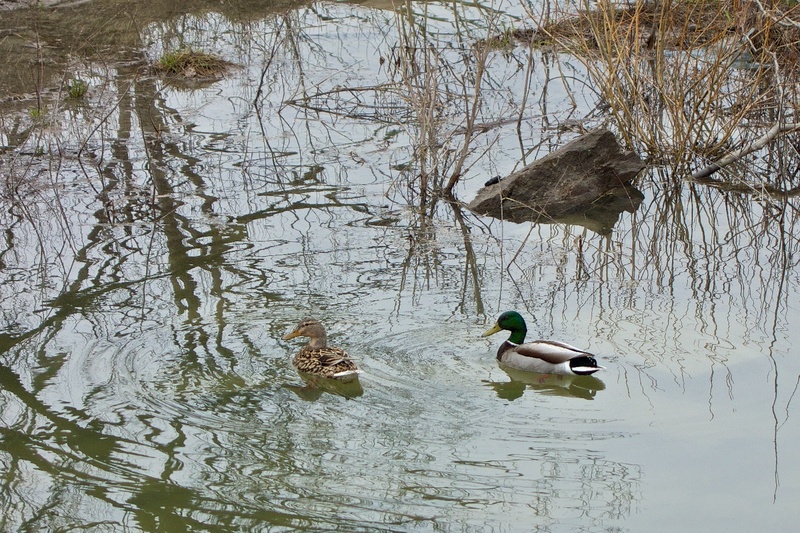 A pair of mallards swim by the Humber. 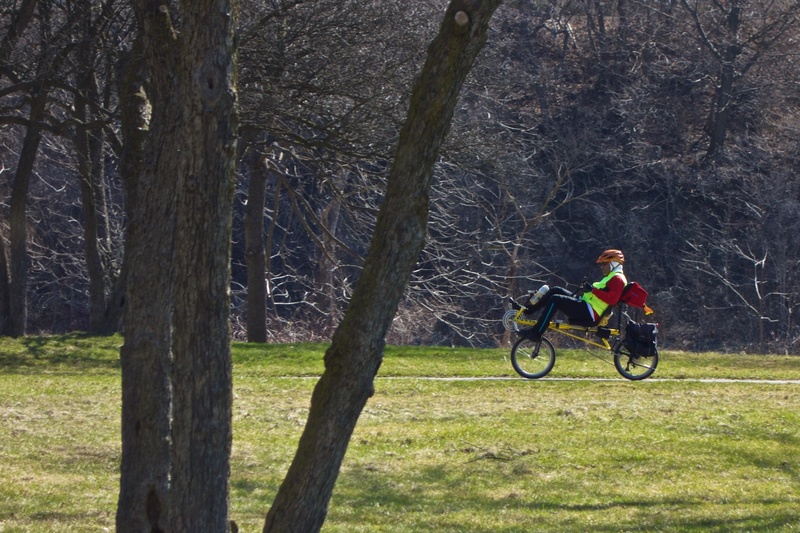 A recumbent cyclist passes by the newly green grass of Raymore Park. Tennis players are out in force at Weston Tennis Club. The downside of spring is also present. 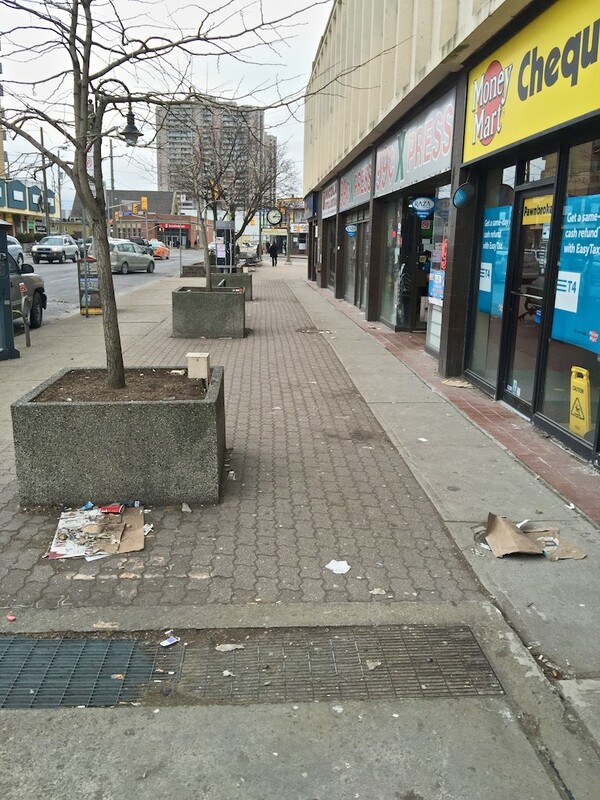 With the stores along Weston Road looking a bit bedraggled, the last thing Weston needs is beggars adding to the atmosphere of neglect. This gentleman happily obliged on Tuesday afternoon. 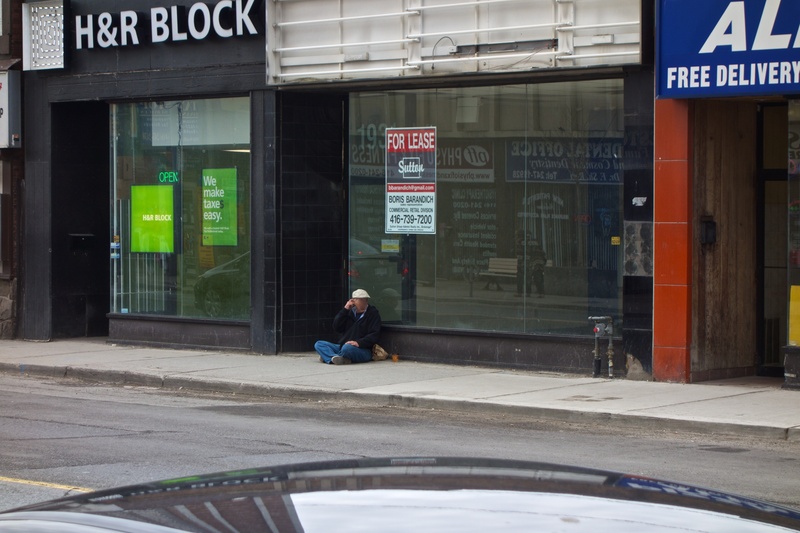 A beggar (face obscured) adds the finishing touch to a sorry-looking Weston Road. Now that the snow has gone, the unsightly legacy of people who litter is revealed in all its glory. This lovely stretch is in Lions Park by the condo’s on Hickory Tree Road. The nearby soccer field is kept very clean so why this adjacent patch is left alone is a mystery. This litter brought to you by folks too lazy to walk to a bin. 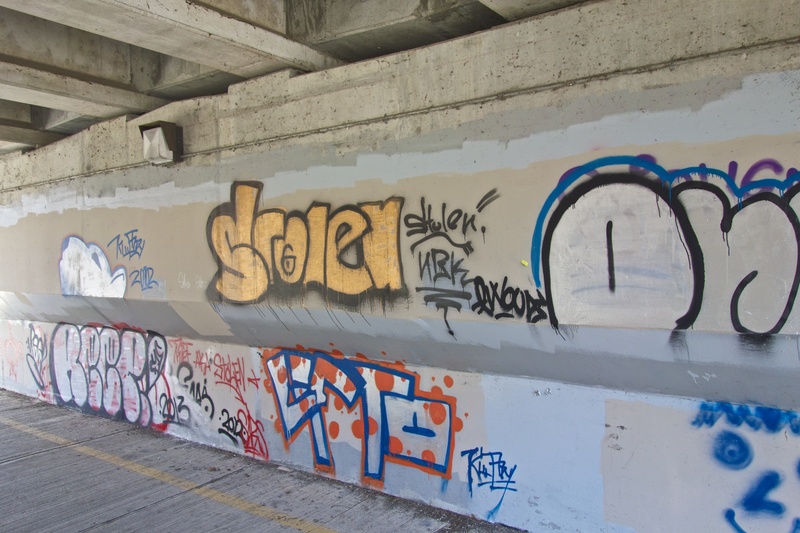 Graffitti by the talentless under the Lawrence Avenue bridge. 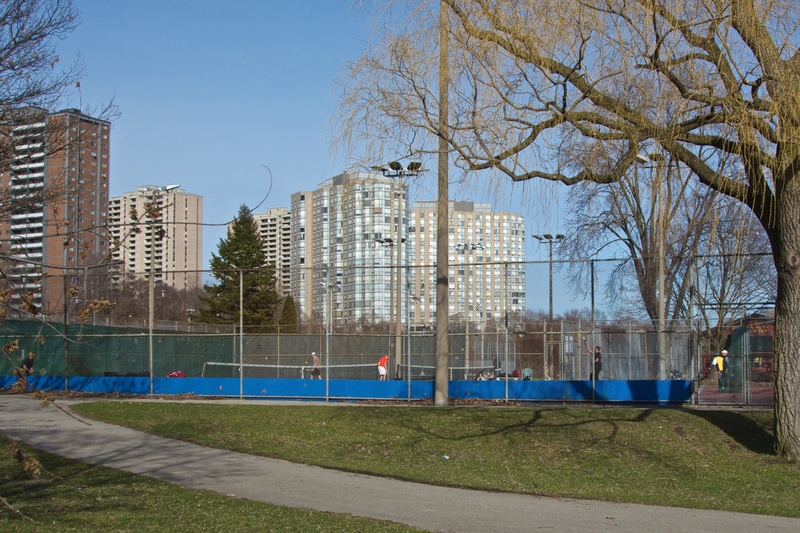 In Toronto we are lucky to have a park system that is accessible to most residents and contains stretches of astonishingly beautiful scenery. As a person who walks daily in our parks, it never fails to astound me how some people aren’t just careless with our parks, they seem determined to fill them with litter. There is a man who on his way through Raymore and Lions parks regularly drinks then drops a can of Ensure (a dietary supplement) along the way. Apparently he is having trouble with his bowel movements as this version of the supplement contains extra fibre. This man will actually pass a garbage can and wait until he thinks nobody is watching before slinging his trash into the grass. He is not alone. There are all manner of food and beverage containers strewn daily by the lazy, malevolent and careless. There is a picnic table by the Lions Park tennis courts that is surrounded by beer bottle caps and other detritus of drinking parties including human waste if you are foolish enough to venture into the nearby bushes. Then there are the dog owners who pick up after their pet but sling the bag into the bush where it will take forever to decompose. 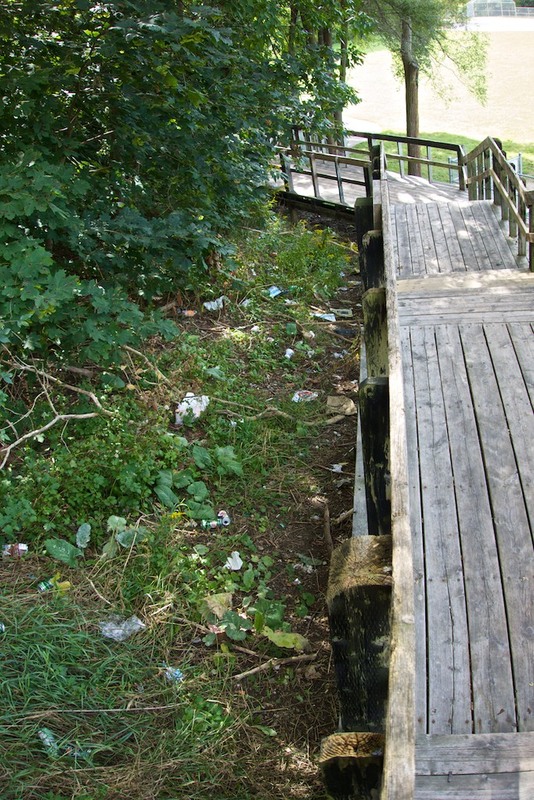 Parks staff and supervisors never seem to be around unfortunately so most often it is left to citizens to remove individual acts of littering or sound the alarm whenever trash builds up in an area (by the stairs leading to Hickory Tree Road for example). We shouldn’t totally despair. There are angels who will without fuss, pick up litter from the park and carry it to a trash or recycling container. They love the parks and operate on the principle that trash attracts more trash. It has been shown that people are more reluctant to litter a clean area than a dirty one. We can only hope in this age of service cuts and an anticipated reduction of park maintenance, that people and the City will increase their efforts to protect our parks and keep them beautiful. If you would like to provide input on the way our parks are run, the city would like your opinion through a survey.